Sport There are 42 products. 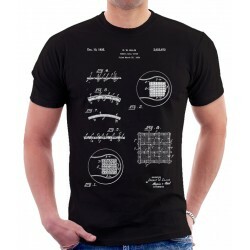 Hockey Puck 1940 Patent T-Shirt UNISEX ROUND COLLAR T-SHIRT - CLASSIC STYLE 150 JERSEY. 100% semi-combed cotton. Reinforcing tape at neck, elastane rib collar.High quality soft cotton t-shirt. Great colors. High quality of printing. Please check the description for the right size for you! Hockey Stick 1935 Patent T-Shirt UNISEX ROUND COLLAR T-SHIRT - CLASSIC STYLE 150 JERSEY. 100% semi-combed cotton. Reinforcing tape at neck, elastane rib collar.High quality soft cotton t-shirt. Great colors. High quality of printing. Please check the description for the right size for you! 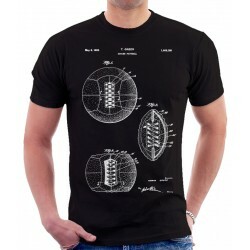 Soccer Ball 1928 Patent T-Shirt UNISEX ROUND COLLAR T-SHIRT - CLASSIC STYLE 150 JERSEY. 100% semi-combed cotton. Reinforcing tape at neck, elastane rib collar.High quality soft cotton t-shirt. Great colors. High quality of printing. Please check the description for the right size for you! Soccer Goalkeepers Glove Patent T-Shirt UNISEX ROUND COLLAR T-SHIRT - CLASSIC STYLE 150 JERSEY. 100% semi-combed cotton. Reinforcing tape at neck, elastane rib collar.High quality soft cotton t-shirt. Great colors. High quality of printing. Please check the description for the right size for you! Table Tennis Bat 1935 Patent T-Shirt UNISEX ROUND COLLAR T-SHIRT - CLASSIC STYLE 150 JERSEY. 100% semi-combed cotton. Reinforcing tape at neck, elastane rib collar.High quality soft cotton t-shirt. Great colors. High quality of printing. Please check the description for the right size for you! Tennis Ball 1934 Patent T-Shirt UNISEX ROUND COLLAR T-SHIRT - CLASSIC STYLE 150 JERSEY. 100% semi-combed cotton. Reinforcing tape at neck, elastane rib collar.High quality soft cotton t-shirt. Great colors. High quality of printing. Please check the description for the right size for you! Tennis Racket 1907 Patent T-Shirt UNISEX ROUND COLLAR T-SHIRT - CLASSIC STYLE 150 JERSEY. 100% semi-combed cotton. Reinforcing tape at neck, elastane rib collar.High quality soft cotton t-shirt. Great colors. High quality of printing. Please check the description for the right size for you! Baseball Ball 1928 Patent T-Shirt UNISEX ROUND COLLAR T-SHIRT - CLASSIC STYLE 150 JERSEY. 100% semi-combed cotton. Reinforcing tape at neck, elastane rib collar.High quality soft cotton t-shirt. Great colors. High quality of printing. Please check the description for the right size for you! Baseball Bat 1903 Patent T-Shirt UNISEX ROUND COLLAR T-SHIRT - CLASSIC STYLE 150 JERSEY. 100% semi-combed cotton. Reinforcing tape at neck, elastane rib collar.High quality soft cotton t-shirt. Great colors. High quality of printing. Please check the description for the right size for you! Baseball Mask 1911 Patent T-Shirt UNISEX ROUND COLLAR T-SHIRT - CLASSIC STYLE 150 JERSEY. 100% semi-combed cotton. Reinforcing tape at neck, elastane rib collar.High quality soft cotton t-shirt. Great colors. High quality of printing. Please check the description for the right size for you! Billiard and Pool Bridge 1908 Patent T-Shirt UNISEX ROUND COLLAR T-SHIRT - CLASSIC STYLE 150 JERSEY. 100% semi-combed cotton. Reinforcing tape at neck, elastane rib collar.High quality soft cotton t-shirt. Great colors. High quality of printing. Please check the description for the right size for you! Billiard Ball 1894 Patent T-Shirt UNISEX ROUND COLLAR T-SHIRT - CLASSIC STYLE 150 JERSEY. 100% semi-combed cotton. Reinforcing tape at neck, elastane rib collar.High quality soft cotton t-shirt. Great colors. High quality of printing. Please check the description for the right size for you!